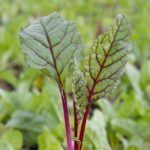 I have grey/brown irregular shaped areas on the leaves of my swiss chard. I thought it might be sun damage from watering in the hot part of the day. It's getting worse. No sign of snails or insects. Fungal? I bought the starts all from the same place. If you have changed watering, (water at soil level and avoid hitting the leaves) and the issue is persisting and spreading, it is likely a fungus or pest issue. Make sure the soil is moist but not soggy, and draining well. Make sure the plant has air circulation around it. Remove leaves that are affected and discard.